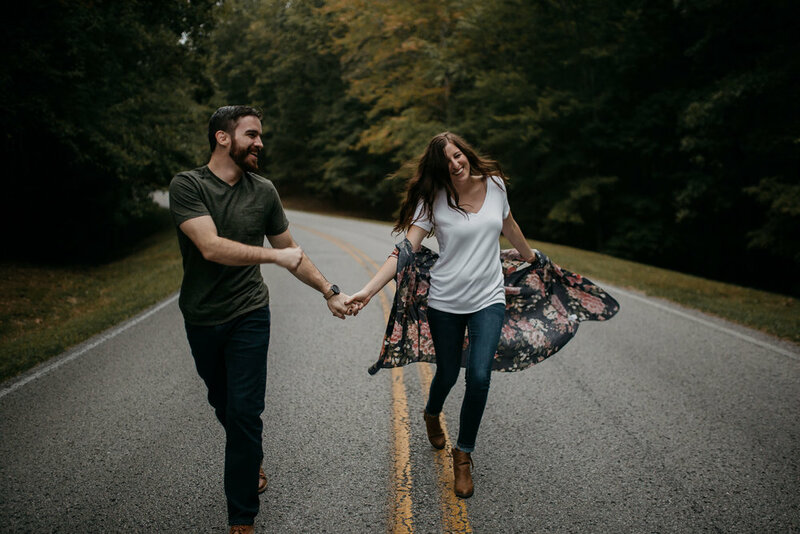 Jeremy + Amanda contacted us for an Adventure Session as their engagement session a few months ago and we immediately started looking for a new park to go explore. She sent me a few waterfall choices and we were totally in love with Fall Creek Falls in Cookeville, TN. We got to know Jeremy + Amanda and they got to know us. We talked about hobbies, bands, movies and laughed at ourselves more than anything, we found out none of us are very coordinated when walking narrow trails haha. We met at the suspension bridge and then proceeded to walk further into the woods. I tell you there is nothing better than a few walks in the woods. I say a few because we walked the same trail 3 times due to being unsure which way to go lol. Needless to say we always have fun on these types of sessions. Locked away from cell phone service, we let Jeremy + Amanda take their time with each other and really embrace their love for each other. Its hard to narrow down when we get couples like J + A who make our job so easy. Here are some of our favorites from their session!!
" I'VE FALLEN IN LOVE WITH ADVENTURES; SO I BEGIN TO WONDER, IF THAT'S WHY I'VE FALLEN FOR YOU."